The Committee has decided that from now on "Runner of the Month" will be known as "Harrier of the Month". Harriers of the Month for April are Nick Richardson for excellent race times and leading training groups, and Ian Rowbotham for Three Peaks and 1st V50 @ Bunny Runs. Congratulations to them both, they will receive technical running shirts from HoM sponsor UP & RUNNING. Clare Smith, whose tale deserves telling (sorry for any embarassment Clare!) ... "Clare .. decided last September to attempt the 3 Peaks this year, and embarked on a 6 month programme specifically for the 3 Peaks. She entered a series of progressively longer fell races to build up her speed and strength, and was very dedicated with her training. It looked like it had all fallen apart when she suffered from a stress fracture of her metatarsal just 6 weeks before the race, and had to have a plaster cast on her foot/ankle for 4 weeks. However she never lost hope, and spent half an hour on the turbo trainer every day to maintain aerobic fitness and strength in her quads, and also swam 3 or 4 times each week. 10 days before the race the pot came off, and she began running again, gradually getting some flexibility and strength back into her ankle. She decided to run the race for the experience, expecting to get timed out at Ribblehead, but managed to get through with 7 minutes to spare. She was then able to continue and finished in just over 5 hours." The Special Achievement Award has been given to Geoff Howard for achieving a new MV65 record in the Wakefield 10K, and to Christine Matthews for her LV55 club record in the St Annes 10 mile road race. Sharon Fuller reports ... 10 miles 2500 feet height, from Hayfield in the Peaks. Emma Payne and Sharon Fuller completed the race together in 2hrs 10 minutes and a few seconds (time to be confirmed). Clare Smith says ... I just wanted to say a really big 'Thank you' to all the wonderful Harriers supporters who came to cheer on the runners at the 3 Peaks race. I was really grateful for all the encouragement, drinks and offers of jelly babies I received during what was, for me, a challenging event. Your support was really appreciated! Rowbo's second MV50 position deserves noting especially as he was only a minute or so behind the legendary Jackie Winn - a terrific result. From Henry Heavisides ...An easier option today than the Three Peaks was the Hyde Park 5k in Leeds. This was my second run in this weekly event improving my time to 19:18, finishing 13th out of 196 runners, the winner was Gabriel Lowry of Leeds Met University AC in 17:37. Jamie Hutchinson reports ... my first tri of the season; 400m pool swim, 20k bike and 5k run. The bike course was altered slightly at the end to take account of some road works. I made a solid start to the season but my swim let me down again! Quite a few Harriers there. The mens event was won in 57.42! Dave Wilby reports ... This weekend in Weardale, Inov-8 hosted the inaugural iROC (Run, Orienteer, Cycle) event. Consisting of 6 races which could be cherry picked or done as a series, the challenges on hand were an 8 mile fell race, a 6 mile straight line orienteering event, a 1 hour score orienteering event, a night MTB time trial, and a 4 mile night fell race on the Saturday, and a 4 hour MTB enduro on the Sunday. All events started from, and also looped back through, the event centre at an old cement works before working their way up through a former quarry (which made for some very interesting technical running & riding), and out on to some fabulous moorland, part of an SSIS unused for racing before. In my wisdom I opted for the 'Grand-Slam', all 6 events and a weekend of pain and suffering, and more than my fair share of fun, sunshine, great company and jelly babies. Heather Dawe was part of the planning team and was responsible for putting on 2 fantastic MTB courses, well done to her. Overall, the event was a great success, and everyone I spoke to seemed to have had a great time. If you fancy one or more of the events, I would encourage you to keep an eye out for this one next year as it really was a brilliant event, amongst a very friendly bunch of like-minded folk. It was also very spectator friendly, and there was entertainment on the Saturday night from local bands so take the family along. For the record, I was 10th overall in the series which was won by in-form fell runner Morgan Donnelly, showing his versatility. 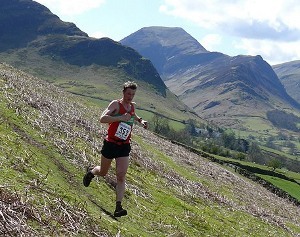 Heather competed in the 8 mile fell race and finished 3rd female, before her planning duties took over the weekend. All details can be found at www.iroc-race.com, and full results should be up soon. Vic V reports ... After two weeks of visiting family and friends, camping in the bush, enjoying fantastic pools, lovely cycling, hitting the surf, Melbourne cafes, going to the MCG to watch some Australian Rules ie having good Australian fun the final day of the trip arrived... So what does one do... Enter a half marathon... The course was quite flat with a few small undulations and considered a fairly fast course. It was set in The Barwon valley... The run was on a bitumen track alongside the river and through some bushland... The noise of a variety of local waterbirds was always to be heard during the race... Anyway I ran a very good time considering I haven't trained properly for the event (1 hour, 40 min and 55 sec)... Afterwards all competitors enjoyed a sausage sizzle, heaps of fresh fruit and good coffee... Well this evening I'll be sitting on a jet bound for Manchester in a much better mood having done the race... It is nice to have done such a race in my hometown..
Ewan Welsh reports ... Enjoyed a lovely sunny day in Hawkshead (and some fish and chips later on that evening in Ambleside) in the Lakes on Saturday, even managed to get myself organised to run the Puma Lakeland trail race, my first race since October, took it easy at the start and worked into it, and to be honest, I felt ok, so there you go. 15k was the distance, only it was a reported 250m longer this year, whereas last year it was also 15k! Anyway matters not a jot as this is a thoroughly excellent well organised race, course is varied, includes quite a few steep (specifically the one from approx 10k to 13k) long climbs, descents where you need to keep "an eye oot" and some tidy tracks not to mention the views, if you take the time to look, which I did. 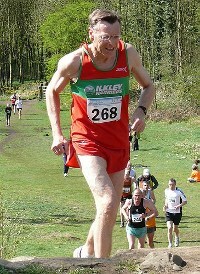 Jerry adds ... had a fantastic day up in Hawkshead on Saturday doing the 15k Trail Race. Just managed to squeeze in to the top 40 (40th !). It was a lot tougher than I had imagined with just over 2500 feet of climbing, but my training on the moors with the Junior Harriers on Saturday mornings proved invaluabl! Ewan Welsh did a great time of 1.23:11 secs and John Woodward in 1.28:59 secs. Well done fellow Harriers, it was great to see other club vests on what was a fantastic day out. Amanda Parnaby reports ... 50 miles from Driffield Showfield around the Wolds and finishing back at Driffield. A different route from last time I took part and there seemed to be a few more hills but still included some picturesque Wolds villages. A chilly start but turned into a lovely day. The event was organised by the East Yorkshire branch of the LDWA. Finished in 12 hrs 59 mins. 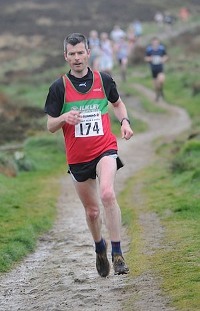 Colin Lugton reports ... Nick Richardson and Sally Malir led home the Ilkley Harriers squad of 11 male and 10 female members in the 14th Guiseley Gallop, which was run in ideal weather conditions on Sunday. The 6 miles multi terrain course from Guiseley took us down through Springs Wood, past the Esholt water treatment works, followed by a long flat stretch along the tow path of the Leeds Liverpool Canal, before some welcome road back to the Woolpack at Esholt, then uphill to Jerrison Wood, and finally along the track to Springs Wood, to finish near the Westside Retail Park. There were excellent performances by Sally Malir (1st LV40, and 4th female), and Bernie Gibbons (1st LV55). Great runs by Nigel Tapper and Keith Wood, who took full advantage of this year�s drier conditions and shaved one and two minutes, respectively, off last year�s times. Jean Sullivan displayed her previous cross-country race skill after returning from maternity leave. Another steady run from Sue Lugton who was nursing a calf injury. Some great support along this varied route with welcome encouragement up the many difficult climbs (another participant described it as like fell running). However, don�t be lulled into a false sense of security, this is a demanding course with tree roots, cobbled setts, styles, and low tree branches at head and other obstacles at head and waist heights. There were no free tea shirts or healthy freebie bags today, but a welcome bottle of Guiseley Gallop beer or a small bottle of wine for every finisher. Henry Heavisides reports ... The Hyde Park 5k Time Trial in Leeds takes place every Saturday at 9am. There are similar events in other parts of the country. It's free to enter, you just have to register in advance. The course isn't the fastest, on paths in the park with sharp turns & undulating, but it's well organised & attracts over 100 runners most weeks, mostly fun runners. The course record set a couple of weeks ago is 15:18, so it does attract some fast club runners. Today was my first participation, finishing 6th out of 105 runners in 19:29, the winner was Gwilym Thomas of Valley Striders in 17:53. Anyway I paid my $3.00 for the privilege and warmed up in the Andy Wolfenden tried and trusted way... That is about 5 laps jog, a few leg flips, some fast feet and of course the compulsory 8x100m strides... I was set to race but fearful of how it would all end up... Could I fly the Ilkley Harriers flag in Australia with pride??? I drew lane 6 in the first of the three 400m heats... There was to be no final (thankfully)... The best time of the three events would be the winner... Never having run this distance competitively for about 30 years I thought to myself I'll just do what Cathy Freeman did in Sydney 2000 ie run flat out... My other tactic was to chase down a fearfully fit looking female competitor in Lane 8... This worked to perfection and I passed this very fast woman with 30 metres to go and WON!!!!! (time 1 min 05.84 sec)... Now that must be some club record... Fantastic!!!!! 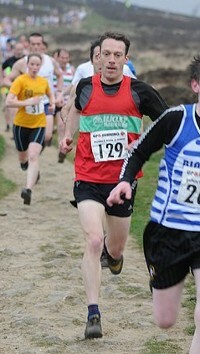 Now Mr Wolfenden I have finally, finally found my forte, 400m races... No need for pace judgement, just go flat out... I did have a nervous wait as the other two heats were completed... In the end I had the best time all round by 0.54 of a second and was declared winner... Not bad I thought to myself..
A host of Harriers (more runners than any other club) enjoyed Bunny Run 1! 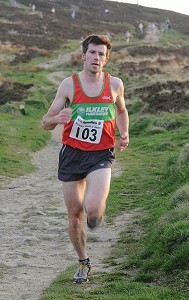 Photos, video, and full results on woodentops.org.uk, and IH League update here. Lawrence Basham reports ... 12.5 miles and 2600 feet of climb, runnable on moorland and forest tracks and paths. Some great views on the way due to the clear skies above. It starts from Guisborough Rugby Club and takes in the "summits" of Gisborough Moor, Easby Moor, Roseberry Topping and Highcliffe Nab. I finished 10th in 90 mins 52. Justin Phillips reports ... An undulating out and back course with chip timing. Not much to look at in the way of scenery but a large field enjoyed the sunshine and raised plenty of cash for charity. The sole entrant of the wheelchair race had the dubious honour of finishing first...and last in his race. Congratulations to Geoff Howard on a new club V65 record. Nigel Tapper reports ... 18 Harriers took part in this multi terrain, popular off-road half and with perfect conditions under foot and in the air, it was a fantastic day for racing. Me and my merry bunch arrived in plenty of time at the Baildon RUFC and indulged in a tasty pre race cuppa. Mr Wood managed somehow to obtain a cup that seemed to contain both tea and coffee, but that didn't appear to hinder his run! It's a considerable hike to the start line for this run giving plenty of time for banter en route in the sunshine. Thanks to Sally and Emma who, on the start line, persuaded myself and Keith that we'd bake if we didn't remove our Helle sub-layer. I for one was very glad I took their advice as the race sets off at a blistering pace! Heading generally down hill (on part of the Rombalds stride route) we were well marshalled into Esholt village and on to a section of the Guiseley Gallop. At the 3 mile mark I managed a fall just after one of the steeplechase obstacles that abound in the area, but with the adrenalin flowing I didn't notice any damage until well after the race was over. The route has it's technical sections with much high knee lifting required through rutted and rooted woods, various stiles, gates and narrow bridges etc before you are spued out onto the calm of the Canal tow-path for several miles of flat torture at speed. The exit from the path was changed this year but it was no easier as runners slowed in the breathless air on the climb up Shipley Glen onto the moor. At the top was a welcome light breeze and a trog across mostly dry moor paths before the descent and then final ascent back to the rugby club. Can I say a big welcome back to racing to Vince Gibbons who showed his true grit by stepping into the fold after daughter Mary was unable to compete on the day. Well done Vince. Think I saw most Harriers in the finish field post race and a few of us enjoyed the tasty fodder provided in the club afterwards. We were pleased to see Sally, Emma and Pange take the team prize for the ladies and Sally 3rd lady. Jolly good morning out! Jane Bryant reports ... An intrepid 6 ladies set out to take on the North's best in the 6 stage Northern Road relays. We managed to find it without a sat nav and put up the tent all without assistance! We then went on to run 6 glorious legs of 2.4m in the sunshine. It was a great venue around 2 parks with an interesting hill at about 1.5m. Everyone had a good run and the team came 24/40. Of course no girls' day out could be complete without a bit of retail at the end!! Although there are a lot of speedy people there, there is a full range of ages and abilites and it was a good team day out, so next year don't be shy let's get 2 teams. A big thank-you to Terry who presented us with specially printed T. shirts for the day (photo's to follow) and to Gaenor who had to put the wine away on sat night due to a late call up (next year, Joan). Amanda P reports ... glorious weather, lovely route and fine food in event organised by LDWA. Finished in 5 hrs 38 mins. Bob Wightman adds ... In addition to Amanda, I would appear to be the only other Harrier representative at this LDWA event. A lovely day with just a slight breeze to keep you cool though the sun did get to me towards the end. Mostly on good paths or tracks, the route was staged in the opposite direction to previous years and this made it much more runnable with only the climb to Beamsley Beacon at around 15 miles proving a bit steep. With the recent dry weather it was possible to get nearly all the way round dryshod, unfortunately there were a couple of recalcitrant wet patches on the descent from Round Hill. Despite blowing up close to the last checkpoint, I managed to do a jog/walk mix to the end (the downhills were worst) and finished in 4hrs 26mins. All very well organised by the Nidderdale group of the LDWA with three refreshment points this would be a good introduction to longer trail events. The run/walk is to be held annually after a change of organiser. From Alison Eagle ... After a bad start to the weekend with delays to flights due to fog, the organisers of the British Championship Ireland race once again came up trumps with a cracking race and great hospitality. Recovering from a sore foot still and not as fit as I would like to be (this being my kind of race, with lots of varying terrain and no tramac in sight) I found the going hard at times, especially up the wet peaty terrain with not enough training in my legs. I welcomed the descent down similar terrain though as I overtook a number of better climbers and was grateful to see the support of my wonderful husband at the end of descent. However that was the scene of my downfall, literally! Glancing at him I missed one of the many rocks, caught my toe and went flying forwards. As is the nature of all fell runners, I bounced up, shouted at Morgan rather grumpily and began the near vertical ascent, with blood dripping from my finger. The ascent was hard work with only being able to pull myself up the heather with one hand. Injuries were sonn forgotten as the descent down the steep rocky terrain needed full concentration, plus lots of painful sliding down the larger rocks as you ignored the zig-zag path. I was pleased to see Morgan again at the bottom of this final ascent, quick drink as I ascended and this time a yell of thanks as I chucked the bottle back to him. The top was a welcome sight and I set of with my last reserves down the more runable terrin, into strong winds to the finish. May thanks to the St Johns Ambulance Service (or the Irish equivalent) who patched me and many others up.